Bitumen is a general term that is used to describe a number hydrophobic petroleum derived substances including petroleum, mineral tars and asphalt. Heated bitumen, (up to 200 degrees Celsius) is used by road-pavers and is a potential source of severe contact burns. Strict safety procedures can prevent life threatening injuries, and many bitumen burns are relatively small and superficial. 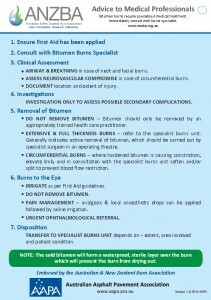 In addition to usual burn first aid measures, the management of burns caused by hot bitumen requires specific consideration as bitumen sticks to the skin once it has cooled, and is then difficult to remove. Cool water, as for thermal burns, remains the most important immediate first aid treatment. Once the bitumen is cooled and solidified, hydrophobic solvents can then be used to dissolve and gradually remove it.